The MIT Sloan CIO Symposium is an annual one-day conference, held on the MIT campus, where CIOs and other senior business executives gather from around the world to exchange leading-edge academic research and technologies. For one day in May, IT leaders network and explore how innovative technologies and leading-edge academic research can help address the practical challenges faced in today's changing economy. Senior IT decision makers engage each other and with thought leaders from academia to find more effective ways to use technology to improve business performance while sustaining their leadership. Scheduled speakers include MIT Professors Erik Brynjolfsson, Andrew McAfee, Andrew Lo and Sandy Pentland. Other scheduled speakers are JP Rangaswami, Chief Scientist for Salesforce.com, John Roese, SVP and CTO of EMC, Tom Leighton, CEO of Akamai and Georgia Papathomas, VP and CIO of J&J Pharmaceuticals. 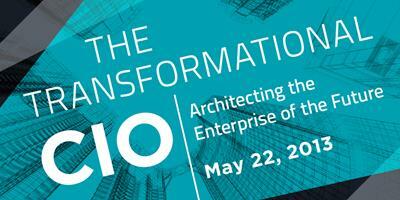 For the full agenda, go to http://www.mitcio.com/agenda. The highlights also include the Annual Innovation Showcase. Price: $795. All MIT Alums can register with promo code SACB2013 for half price - $395.